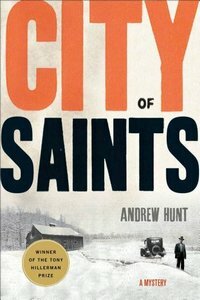 City of Saints by Andrew Hunt, a Mysterious Review. Review: Set in Salt Lake City in the 1930s, Art Oveson is a young county sheriff's deputy who, when face with a gruesome murder, must assume the responsibilities of a homicide detective in City of Saints by Andrew Hunt, the winner of the 2011 Tony Hillerman Prize for best debut mystery set in the American West. Helen Pfalzgraf, the young wife of a prominent doctor, has been found dead, an automobile having run over her body repeatedly. With his partner Roscoe Lund, Oveson begins his investigation into her murder. It isn't long before they discover that Helen wanted more out of life than simply being married to a wealthy older man. She had dreams of becoming a movie star, visiting Hollywood … and having an affair with a local celebrity. She loved to travel, with Paris being one of her favorite destinations … where she had an affair with a Frenchman. Indeed, there were rumors that Helen had numerous lovers within Salt Lake City itself. Sheriff Fred Cannon, up for re-election, thinks that Oveson is dragging his heals by not arresting someone, and proceeds to fire both he and Lund. They continue their search, however, all the while facing extensive corruption, blackmail, and more murder. City of Saints is a compelling mystery, start to finish. In addition to the solidly written storyline, there is the strongly developed character of Art Oveson, a seemingly outsider in his own city. His large Mormon family is bound by their faith, but that is often in conflict with the methods of police investigation in the early decades of the 20th century. Oveson doesn't come across as a "goody two-shoes", but he does have principles and abides by them. And even though Oveson's own partner is everything he is not, he still stands by and with him throughout. It isn't clear if this is the first in a series, but readers would likely welcome Art Oveson back into their homes. Special thanks to guest reviewer Betty of The Betz Review for contributing her review of City of Saints. Acknowledgment: Minotaur Books provided a copy of City of Saints for this review.